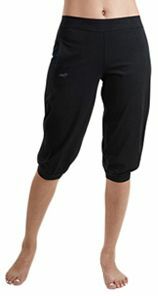 The relaxed Capri has a waistband made from soft elastic that hugs and flattens your waist. The gathered back waist provides ease and comfort while performing asanas. The bottom hem of the Capri has a band that holds firm during inversions allowing you to perform extreme stretches. HYPERBREATH fabric caresses the skin, while it controls shrinkage and color fastness.